With their pangolin-like armour-plated exterior, artichokes are absolutely gorgeous to look at. They’re even more gorgeous to eat. Of course, if we’re going to be picky they’re not really a vegetable at all, but the flowering bulb is a member of the thistle family. It’s not always easy to get one’s hands on artichokes, as they are highly seasonal. But that doesn’t mean you can’t enjoy the wonders of artichokes year round...to the rescue comes your larder with preserved artichoke hearts. Artichokes marinated in gorgeous flavoured oil are stunning on an antipasti platter. But that’s not all marinated artichokes are good for. You can cook with them too! 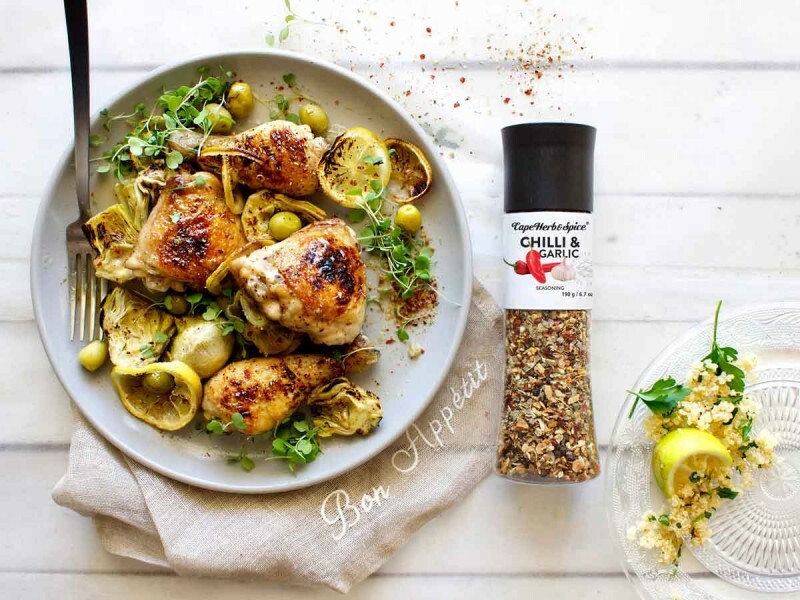 Here we’ve used them to create a chicken tray bake with gorgeous tangy lemons and green olives – made all the more special with our fabulous new Cape Herb & Spice Chilli & Garlic grinder. Serve it up with herby, lemony quinoa and you have yourself a pretty impressive (yet super easy) little dinner. Preheat your oven to 200 ºC. Place the chicken pieces on a baking tray and brush lightly with the oil from the marinated artichokes before grinding over your Cape Herb & Spice Chilli & Garlic seasoning – how much depends on how spicy you like it (we err on the side of generous!). Stud lemon slices between the chicken pieces. Roast for 30-35 minutes until the chicken is cooked through and golden. Add the olives and artichokes for the last 5 minutes. They don’t need to cook, but rather to be heated and get the slightest char. Drizzle the warm quinoa with a splash of olive oil, stir in the parsley and give it a generous squeeze of lemon. Then, season to taste with Cape Herb & Spice Sea Salt and that’s dinner done!